The DIO96-104 is an 8-bit PC/104 peripheral providing 96 TTL/CMOS compatible digital Input/Output channels. It conforms to the PC/104 standard and operates on a single +5V power supply. The channels are organized as four 24-bit groups. Each group is controlled by a separate 82C55A peripheral interface chip which further segments its 24 channels into three 8-bit ports. This industry standard device offers very flexible configuration including software programmable port directions and strobed handshaking. 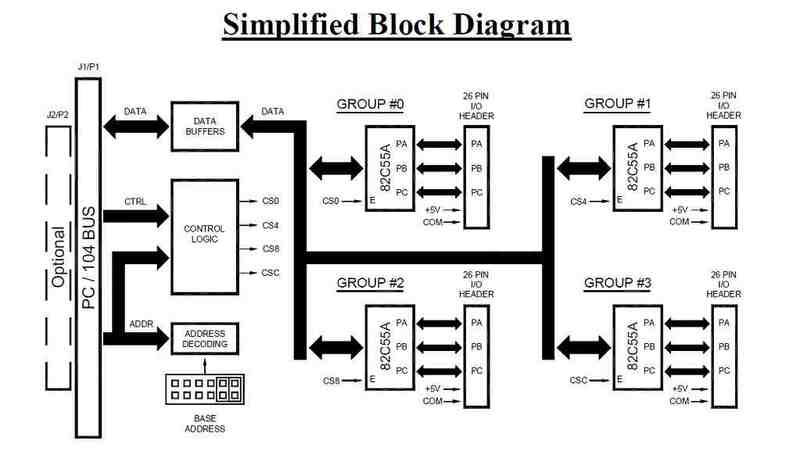 Groups are routed to corresponding 26-position I/O headers for all external wiring. Connections to the hosts +5V and GND are also available for convenient powering of external circuitry. During system reset all channels default to a high impedance input state. Pull-up and pull-down resistors are absent allowing the user's circuitry to dictate how each channel will be handled during reset and input modes. The DIO96-104 occupies 16 consecutive byte locations within the hosts I/O space. The starting address is jumper selectable between 0x000 through 0x3f0. 96 non-isolated digital I/O channels arranged as four 24-bit groups with each group consisting of three 8-bit ports. 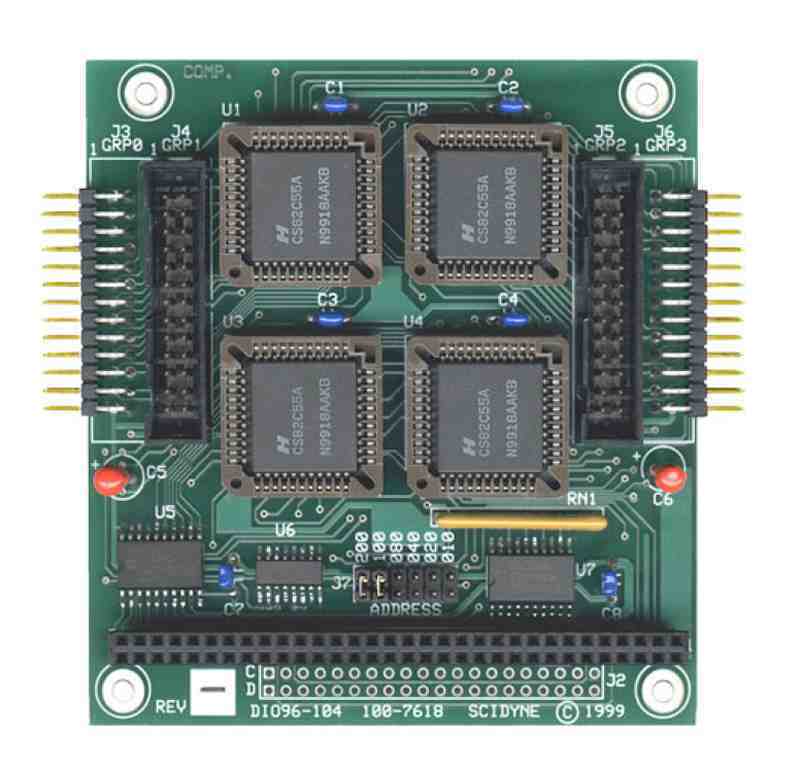 Each group is controlled by a separate 82C55A peripheral interface chip and supports operating modes 0, 1, and 2. Interrupts are not supported. Designed, Engineered, and Assembled in U.S.A. by SCIDYNE Corporation using domestic and foreign components.